Innovative & stylish. Perfect for large windows. Window treatments are a seriously important and often overlooked as part of a room. They can be functional, purely decor, or strike a balance between the two, depending on your space and the amount of natural light you receive. If you’ve got a small space, opt for slim blinds that’ll still let natural light in. Organic, woven fabrics keep a space feeling light and airy. Use a Roman shade to add pattern to a room. If you’re wary of it feeling too bold, keep the wall a neutral tone. If you’re lacking on windows, choose sheer panels for maximum light. It’ll help keep the room from feeling too closed off. Interior shutters protect against sun and heat in summer and wind and cold in winter. Exterior shutters eliminate the need to install plywood over windows before a storm. They also protect windows from flying debris and high winds, especially in hurricane prone areas.Window shutters are a type of window treatment that adds charm to window settings. They can be installed on the inside for easy access or on the outside for protection from storms. Easy access is one reason that sliding glass doors often feature vertical blinds rather than horizontal blinds.Horizontal blinds are used on tall, narrow windows. Rolled up from the bottom, as opposed to sideways, horizontal blinds lift via a cord-and-pulley system. Whether it’s a light, sheer fabric or more luxurious velvet, curtains are one of the best ways to pull a master bedroom together. “How do I pick the right curtains to complete the space?” Before throwing your arms up in defeat or, even worse, giving up altogether, let me share with you some helpful tips we use to pick the perfect drapes every time. Drapery is notorious for placing strain on a budget but that doesn’t mean that you shouldn’t use it to cover your windows. I find it’s best to contemplate what look you are aiming for in your space and consider the scale and placement of the windows before moving on to budget. If your window is large, or if it requires a continuous drape, or you have very tall ceilings, I would recommend investing in custom drapery. While the price tag will be higher, you will receive a finished look that is exclusive to your space and style. Custom window treatments are always my first choice. Selecting the best curtains for your style means recognizing what you are personally drawn to when it comes to home décor. I recommend doing a bit of virtual room hunting ( Pinterest is great for this) before diving into the window treatment world. With so many options available, it’s no surprise that the majority of consumers default to white curtains. While I understand that choice and love white curtains for a clean look, there are many options available for windows waiting to be utilized. I challenge you to step outside of the comfort zone and try a little color or pattern on your window. You might be surprised how variety can personalize a room and change how it feels. There are four types of thickness to consider when curtain shopping: sheer, opaque, lined, and blackout. I find it’s best to ask what the room needs. Sheer curtains are ideal for layering on top of existing blinds or shades as well as standing alone for an ethereal, soft look. The most common type of ready-to-hang curtains are opaque curtains. Lined and blackout curtains are the best option for privacy, light blocking, and energy efficiency and are the preferred choice for entertainment rooms and bedrooms. I consider drapery headers a major factor that plays into categorizing curtains and what style of space they best compliment. With over 15 styles available, it can easily be the most overwhelming style decision made when shopping for curtains. I find the best way to approach choosing a header is to categorize your style as casual or formal. Casual styles which include modern, transitional, bohemian, and rustic and are best suited to back tab and grommet finish curtains. Both of these offer a clean finish to the hang of the panel, controlling how the folds fall and are available in both ready-to-hang and custom drapery. For a more formal space, such as traditional and shabby chic, I recommend flat fold and pleated drapery which have exaggerated folds and a voluminous drape. The final element I consider when purchasing drapery is length. There are so many ways to change the style of a room with length alone. 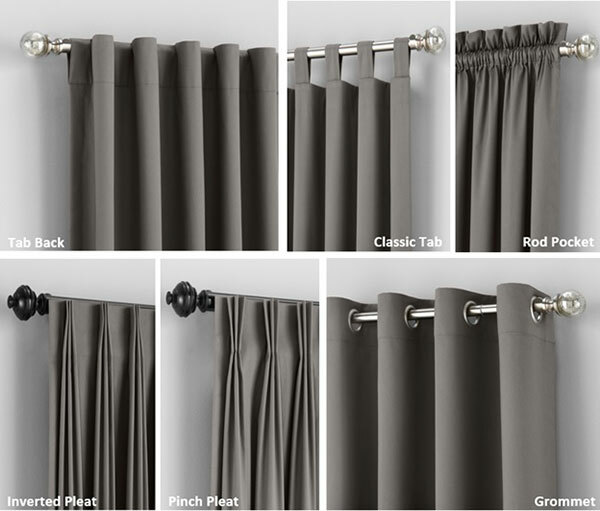 While custom drapery will be available in almost any width and length desired, you’ll find ready-to-hang curtains are limited to four or five set lengths which restrict how you hang your curtains and are usually confined to just above the window. If you are wanting something more modern or are looking to expand the visual size of a room, I recommend hanging the drapery higher above the window, either to the ceiling or at a given height in-between the window and ceiling. Another style to consider is pooling, which occurs when the remaining fabric of a panel gathers on the floor. This style of hang is best limited to rooms with restricted use or homes without children or pets and is complementary to bohemian, contemporary, and shabby chic design. After sharing some of the tips I utilize when selecting curtains, I feel it’s best to leave this last piece of design advice. Be brave and make bold choices. Curtains can inject a lot of personality into a space to truly convey your style. Sometimes you have to make decisions that can seem scary and a bit of a risk. Take the leap and have a back-up, just in case the bold choice doesn’t work out.